Tired of Suffering? Joy is a choice. I won't promise you that it will be done in seconds or minutes. If it were so easy I am sure you would have done it by now with all the books and instructions around. Forty years of research, work with thousands of people from all over the world and a lifelong experience of Selfgrowth and transformation have taught me that many people resist doing what would be good for them. 1. Christian values program you for suffering. They are so deeply rooted that they are hard to see and even harder to overcome. 2. Our consumer society trains you for 'quickies'. The faster, the better. In my experience, changing deep-rooted beliefs and habits cannot be done in minutes. It takes a focused and continuous effort. 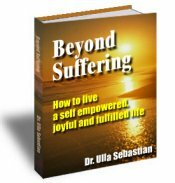 The book provides the tools how to build your physical and inner strength so that you develop the necessary stamina to move beyond suffering. 3. Our medical and psychotherapeutic system are based on Newtonian principles. Have you ever wondered why all your work on the physical, emotional and mental level hasn't really changed basic patterns in your life? The reason is that energetic patterns hold physical symptoms, emotional disturbances and negative belief systems in place. For basic shifts to happen your body-mind-system needs rewiring so that all your work gets integrated and synthesised on a higher level of frequency. Christian values, consumer values and Newtonian principles for our health are the bad news. The good news is: We got other choices. 1. Eastern traditions have taught us for thousands of years that we are the creators of our life. We can take control of our thoughts and use the power of the mind to create the reality that we want. 2. Quantum physics helps us to see any disease, emotional disturbance, conflict or mental problem as a disruption or distortion within the informational energy field. Using work with inner images and resonance patterns, we can correct the dissonance within the information field of the body and create a higher level of coherence. You experience this higher level of coherence as a state of well-being and contentment. Besides addressing health problems, we can also use these new holographic models for prevention by detecting problems in the energetic field before they materialise physically. Problems that easily manifest as bodily symptoms are negative thought forms, conflicts or emotional disorders. What is the benefit of this book for YOU? Consciousness heals. Consciousness is a tool that allows you to see through the illusions and confusions that make you prone for suffering. You also need hand-on tools such as exercises and instructions. The book provides you with a manual of transformation providing you with tools on the mental, emotional and physical level. Copyright Dr. Ulla Sebastian / Visioform © 2004-2017. All rights reserved.